Missed on Dogs, Broncos, Souths and Cronulla and got lucky with Canberra giving us half a point - but given the main tipping comps give you a full point - for consistency we'll give it as 'right'. Obviously our weakest week so far but still a 4/8 week early isn't soul destroying. 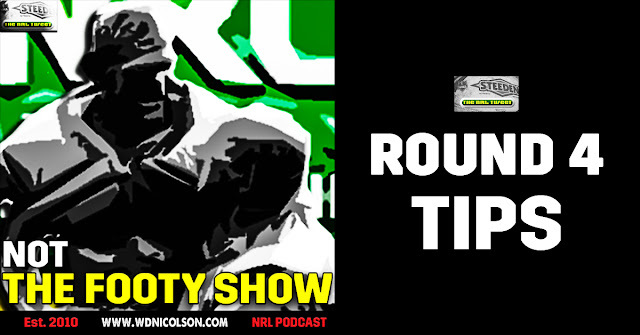 Round 4 Tipping Skinny: Toughest Round of the year so far - so if we end up near 6/8 - we will take it with both hands. We're probably over-rating the Bulldogs but we're also loathe to over-rate the Bunnies without Sam Burgess, going Brisbane to bounce back and beat the Cowboys, Raiders to just beat the Titans, Roosters to stun Manly, Dragons to somehow outlast the Panthers, Warriors to crush the Knights, Tigers to somewhat shock Parra and Cronulla to end Melbourne's winning streak. But hey - we've been wrong before!